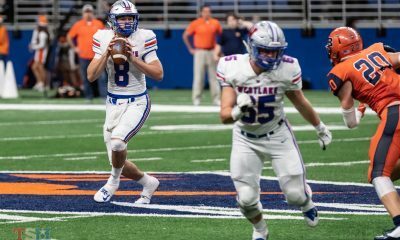 TSM: I know as a coach, you all like taking it one game at a time, but how sweet would it be to bring Westlake its first state championship since Drew Brees was quarterbacking back in 1996? Coach Dodge: Oh gosh, it would be awesome. It would be something that obviously this entire student body would carry for the rest of their lives, not only the football team. We were basically 15 seconds away two years ago and that was a heartbreaker. To miss a field goal to win it with about 15 seconds left in the game, that’s how close we were to getting the second one. But now you got to start all over again. But it absolutely would be a thrill and something we’re always striving for. Our goals our to win a district championship, and then to be playing Thanksgiving. That means you made it to the final 16 in the state, and once you get there, you can really just let everything fly and see if you can’t go make a run at it. 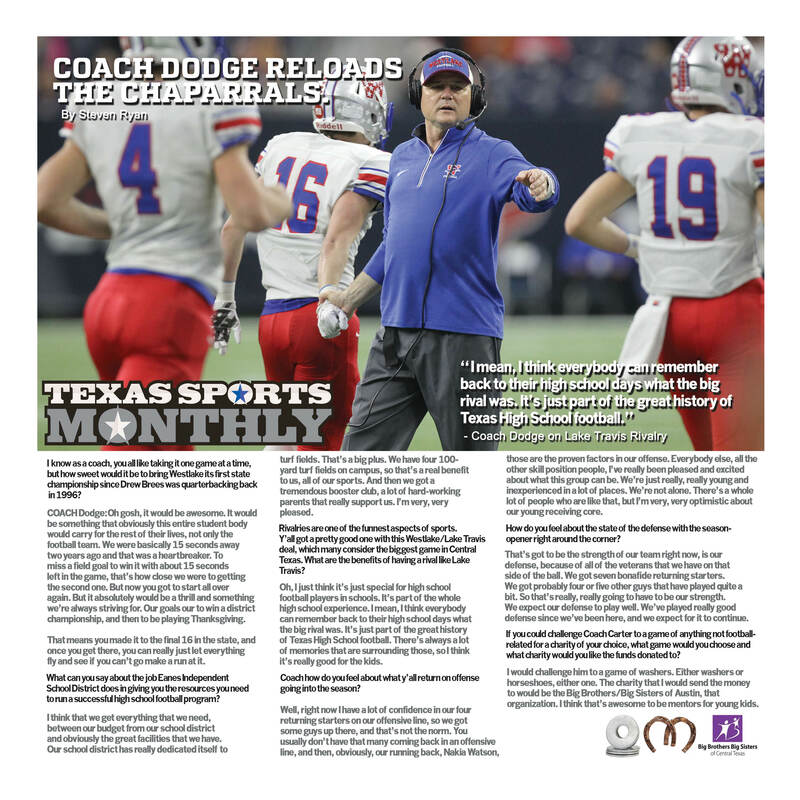 What can you say about the job Eanes Independent School District does in giving you the resources you need to run a successful high school football program? I think that we get everything that we need, between our budget from our school district and obviously the great facilities that we have. Our school district has really dedicated itself to turf fields. That’s a big plus. We have four 100-yard turf fields on campus, so that’s a real benefit to us, all of our sports. And then we got a tremendous booster club, a lot of hard-working parents that really support us. I’m very, very pleased. Rivalries are one of the funnest aspects of sports. 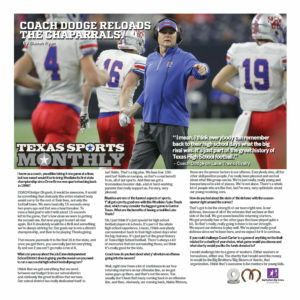 Y’all got a pretty good one with this Westlake/Lake Travis deal, which many consider the biggest game in Central Texas. 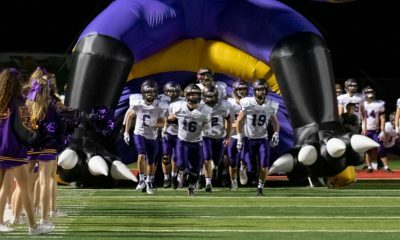 What are the benefits of having a rival like Lake Travis? Oh, I just think it’s just special for high school football players in schools. It’s part of the whole high school experience. I mean, I think everybody can remember back to their high school days what the big rival was. 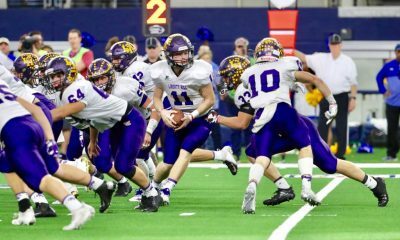 It’s just part of the great history of Texas High School football. There’s always a lot of memories that are surrounding those, so I think it’s really good for the kids. How do you feel about what y’all return on offense going into the season? Well, right now I have a lot of confidence in our four returning starters on our offensive line, so we got some guys up there, and that’s not the norm. You usually don’t have that many coming back in an offensive line, and then, obviously, our running back, Nakia Watson, those are the proven factors in our offense. Everybody else, all the other skill position people, I’ve really been pleased and excited about what this group can be. We’re just really, really young and inexperienced in a lot of places. We’re not alone. There’s a whole lot of people who are like that, but I’m very, very optimistic about our young receiving core. How do you feel about the state of the defense with the season-opener right around the corner? That’s got to be the strength of our team right now, is our defense, because of all of the veterans that we have on that side of the ball. We got seven bonafide returning starters. We got probably four or five other guys that have played quite a bit. So that’s really, really going to have to be our strength. We expect our defense to play well. We’ve played really good defense since we’ve been here, and we expect for it to continue. If you could challenge Coach Carter to a game of anything not football-related for a charity of your choice, what game would you choose and what charity would you like the funds donated to? I would challenge him to a game of washers. Either washers or horseshoes, either one. The charity that I would send the money to would be the Big Brothers/Big Sisters of Austin, that organization. I think that’s awesome to be mentors for young kids. 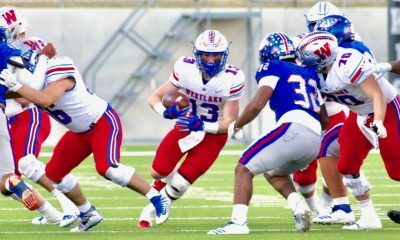 Can Westlake beat Lake Travis? AGAIN?